Week of Action - #SchoolPushout ? Help Us Spread the Word! 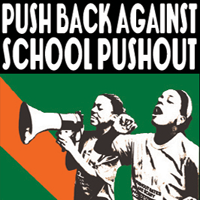 Get all the details about the 4th Annual National Week of Action on #SchoolPushout, September 28 - October 5, 2013. Join us for this National Week of Action to help end the nation’s school pushout crisis. School systems must adopt positive approaches to discipline instead of relying on zero tolerance policies, school police, armed guards, and other punitive practices that push young people out of school. Our National Week of Action calls on states and school districts to prioritize funding for counselors, school psychologists, community intervention workers and the implementation and training of teachers and school personnel in positive discipline practices.